This volume features the results of a meeting held at the National Institutes of Health to advance the goals of having the menstrual cycle accepted and understood as a marker of general health in adolescent girls and defining a related research agenda. Specific topics covered in the volume include: (1) normal processes of the adolescent menstrual cycle, including menarche, the psychology of puberty, and cultural perceptions and practices surrounding menarche; (2) disease processes and the adolescent menstrual cycle, including genetic mechanisms of amenorrhea, Turner syndrome, FMR1 premutation, galactosemia, disorders of sexual differentiation, congenital adrenal hyperplasia, chronic disease, chemotherapy, autoimmune oophoritis, premature ovarian failure, and polycystic ovary syndrome; (3) bridging normal and abnormal processes, including amenorrhea, dysmenorrhea, adolescent antecedents to adult reproductive disorders, bone health, and HRT in the adolescent; (4) modern dilemmas and the adolescent menstrual cycle, including developmental delay, obesity, exercise–induced amenorrhea, eating disorders, stress–induced amenorrhea, and amenorrhea induced by medications; (5) the synthesis of the volume consisting of a contribution on the transition to adulthood. Prologue: From a Fire in the Belly to a Boiling Heart: Fuel for Participatory Research: Karima Hijane Carly Heyman, Maureen Lindenhofen Bell, Mary Beth Busby. Part I: The Normal Adolescent Menstrual Cycle:. 1. Menstrual Cycle: Basic Biology: Shannon M. Hawkins and Martin M. Matzuk. 2. Pubertal Development and Menarche: Sara Divall and Sally Radovick. 3. Menstruation in Adolescents: What s Normal, What s Not: Paula J. Adams Hillard. 4. Psychosocial Development and Puberty: Mary B. Short and Susan L. Rosenthal. 5. The Menstrual Cycle: A Biological Marker of General Health in Adolescents: Vaishali B. Popat, Tamara Prodanov, Karim A. Calis, Lawrence M. Nelson. 6. 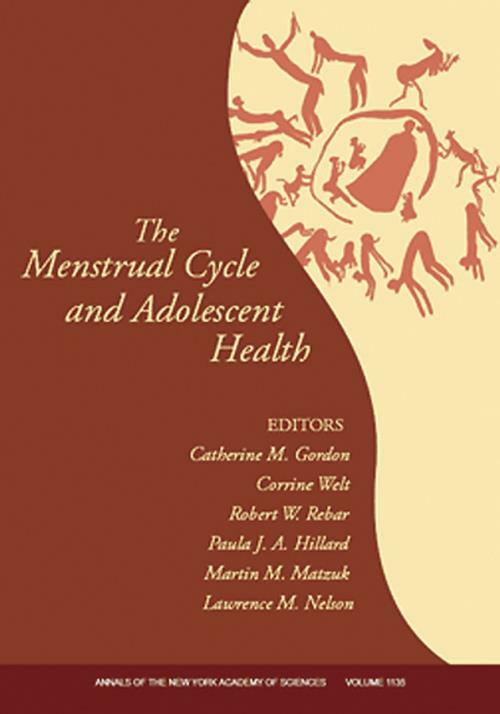 The Menstrual Cycle and Adolescent Health: Insights on Age at Menarche from the TREMIN Research Program on Women′s Health: Susannah H. Barsom, Heather E. Dillaway, Patricia B. Koch, Mona L. Ostrowski, and Phyllis K. Mansfield. 7. Cultural Perceptions and Practices around Menarche and Adolescent Menstruation in the United States: Margaret L. Stubbs. Part II: Disease Processes and the Adolescent Menstrual Cycle:. 8. Disorders of Sexual Differentiation in the Adolescent: Peter A. Lee and Christopher P. Houk. 9. Polycystic Ovary Syndrome in Adolescents: Susan K. Blank, Kristin D. Helm, Christopher R. McCartney, and John C. Marshall. 10. Menstrual Health and the Metabolic Syndrome in Adolescents: Hayla Tfayli and Silva Arslanian. 11. Diagnosis and Management of Congenital Adrenal Hyperplasia in Adolescents: Karen Lin–Su, Saroj Nimkarn, and Maria I. New. 12. Reproductive Health of Adolescent Girls Who Carry The FMR1 Premutation: Expected Phenotype Based on Current Knowledge of Fragile X–associated Primary Ovarian Insufficiency: John J. De Caro, Celia Dominguez, Stephanie L. Sherman. 13. Galactosemia and Amenorrhea in the Adolescent: Gerard T. Berry. 14. Autoimmune Oophoritis in the Adolescent: Corrine Welt. 15. Cancer Treatment and the Ovary: The Effects of Chemotherapy and Radiation: Laurie Cohen. 16. Moving Toward an Understanding of Hormone Replacement Therapy in Adolescent Girls: Looking through the Lens of Turner Syndrome: Marsha L. Davenport. 17. Premature Ovarian Failure in the Adolescent: Bob Rebar. 18. Genetic and Phenotypic Heterogeneity in Ovarian Failure: Overview of Selected Candidate Genes: Joe Leigh Simpson. Part III: Bridging Normal and Abnormal Menstrual Cycle Processes:. 19. The Psychology of Antecedents to Adult Reproductive Disorders in Adolescent Girls: Sharon N. Covington, Pedro E. Martinez, Vaishali Popat, Radha Nandagopal, Mary Ryan, Lawrence M. Nelson. 20. The Pathophysiology of Amenorrhea in the Adolescent: Neville H. Golden and Jennifer L. Carlson. 21. Stress–Associated or Functional Amenorrhea in the Adolescent: James H. Liu. 22. Dysmenorrhea in Adolescents: Zeev Harel. 23. The Menstrual Cycle and Bone Health in Adolescents: Barbara A. Cromer. 24. Hormone Replacement Therapy for the Adolescent Patient: Amy D. DiVasta and Catherine M. Gordo. Part IV: Modern Dilemmas and the Adolescent Menstrual Cycle:. 25. Long–term Skeletal Effects of Eating Disorders with Onset in Adolescence: Madhusmita Misra. 26. Menstrual–Cycle Dysfunction Associated with Neurological and Psychiatric Disorders and their Treatment in Adolescents: Hadine Joffe and Frances J. Hayes. 27. Menstrual Issues in Adolescents with Physical and Developmental Disabilities: Elizabeth Quint. 28. Preservation of Menstrual Function in Adolescent and Young Females: Ozgur Oktem and Kutluk Oktay. 29. Exercised–Induced Amenorrhea and Bone Health in the Adolescent Athlete: Michelle P. Warren and Abigail T. Chua. 30. Eating Disorders and Menstrual Dysfunction in Adolescents: Ellie Vyver, Cathleen Steinegger, and Debbie Katzman. 31. Adolescent Obesity and Puberty: The Perfect Storm : Carolyn Bradner Jasik and Robert H. Lustig. Part V: Summary and Synthesis:. 32. Research Involving Adolescents as Subjects: Ethical Considerations: Robert J. Levine. 33. Improving Balance in Regulatory Oversight of Research in Children and Adolescents: A Clinical Investigator s Perspective: Robert L. Rosenfield. 34. Reflections on Future Research in Adolescent Reproductive Health: Catherine M. Gordon, D. Lynn Loriaux, Melvin M. Grumbach, Alan Rogol, and Lawrence M. Nelson. Epilogue: Passion for Participatory Research on the Menstrual Cycle: Catherine M. Gordon, Karima Hijane, Carly Heyman, Maureen Lindenhofen Bell, Mary Beth Busby, and Lawrence M. Nelson.